There was a Christmas potluck in my house and I said I will make a baked ham. It was going to be my first time and I spent some time looking up recipes and also comparing supermarket ham and ham from a butcher. I decided on buying a smoked bone-in ham from a meat shop in town. “Good ham comes from good pork,” the butcher said. It feels good to buy and eat locally too. Next was the glaze. I decided to make one with ingredients on hand. Based on a Martha Stewart recipe, pure orange marmalade was blended with Dijon mustard and brown sugar for a sweet, slightly bitter and spicy taste. 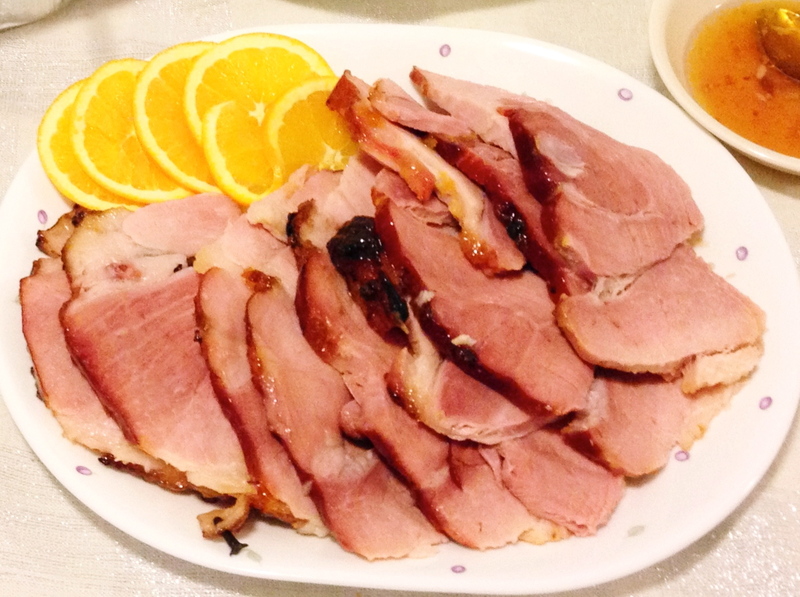 The ham turned out wonderful and the best thing is, it’s so simple to make as the ham is already cooked. No fears of serving undercooked meat to the guests! The ham smelled so good when it was out of the oven. In the eagerness to slice and serve it, I forgot about taking pictures! There’s only a picture of me putting the cloves on after the first hour of baking, and the picture of the sliced ham above. 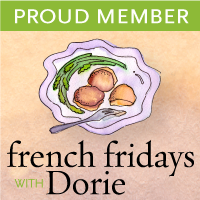 Take the ham out of the refrigerator 1 hour before baking to let it come to room temperature. 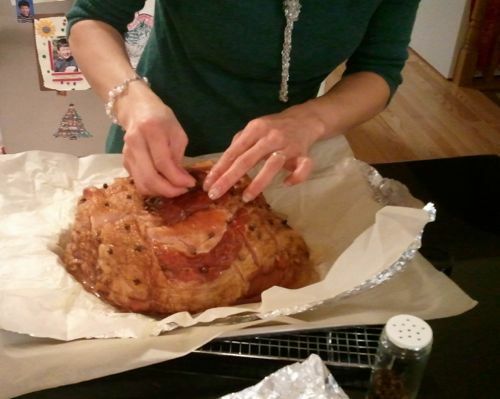 Rinse the ham, pat it dry and wrap tightly in parchment paper-lined aluminium foil. Place on a baking tray and bake on the lowest rack in a 325 degrees F oven for 1.5 hours. After 1.5 hours, remove the ham from the oven and increase the oven temperature to 425 degrees F.
Unwrap the ham and score the fat in a diamond pattern. Place a clove in the centre of each diamond and brush half the glaze over the ham. Return the ham to the oven and bake for 20 minutes. Remove the ham and brush the remaining glaze over the ham and return it to bake till the glaze’s dark and caramelised, about 10 minutes. 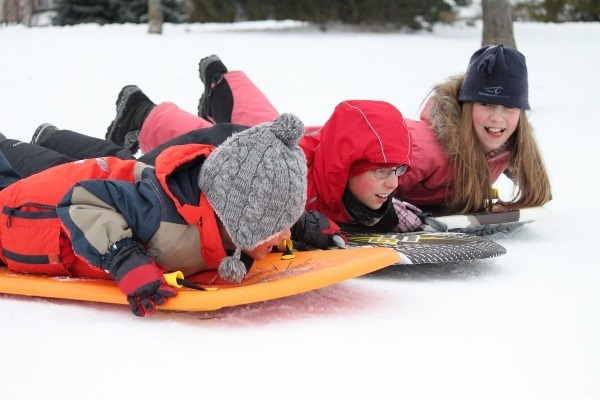 Remove to a cutting board and tent with foil for 10 minutes before slicing. 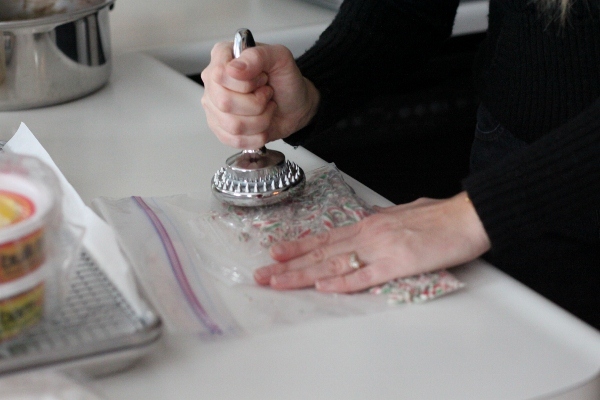 I went over to Sandy’s house today to bake Christmas cookies together. 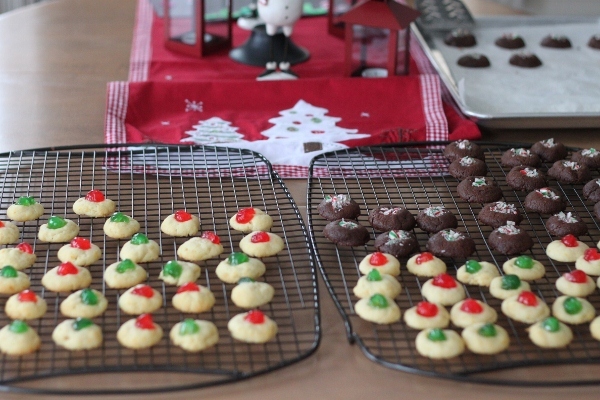 She made Mint Chocolate Truffle Cookies while I made Christmas Cherries. The cookie doughs were made earlier so we just had to roll them out to bake. 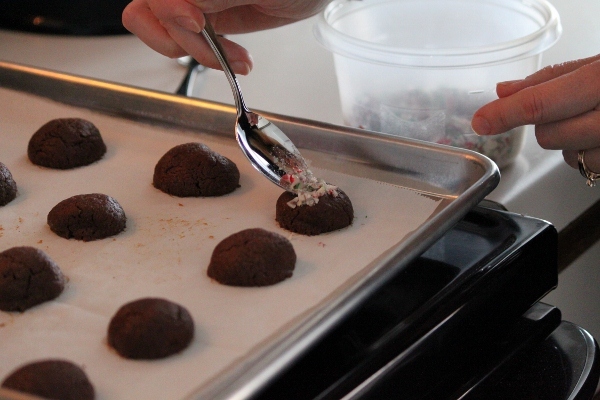 The truffle cookies were fun and easy to make: make dough, smash candy, roll dough into balls, bake, make a dent, sprinkle! They were fudgy and chocolately. It’s very important not to overbake them. If you don’t like mint or candy cane in your cookies, omit the candy and eat them plain or with some melted chocolate drizzled over. 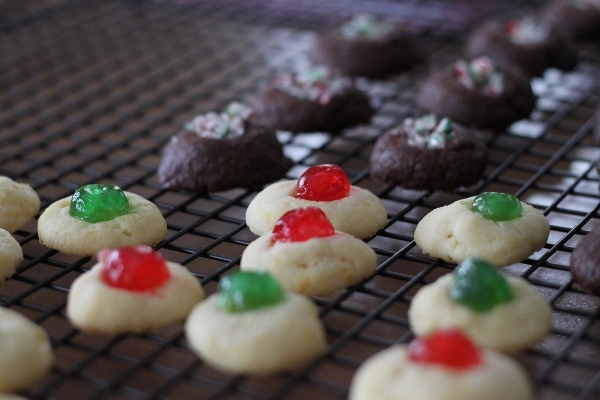 The Christmas Cherries were citrus-flavoured soft cookies. I didn’t roll them as small as Pioneer Woman did but I got more than 50 cookies from one recipe. If you’re using unsalted butter, add in a pinch of salt. 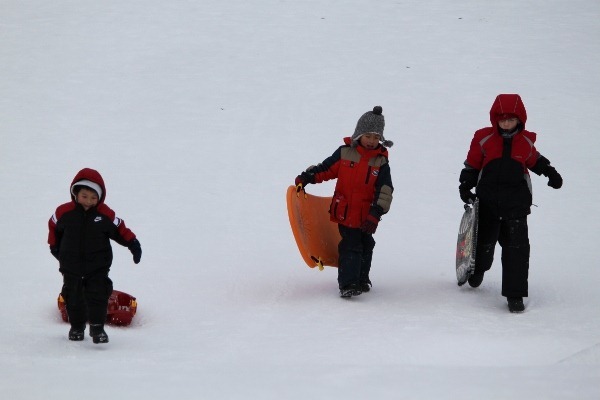 While the moms are baking cookies, the kids went sledding. We dropped by to watch them after finishing the last tray. It was so chilly outside that it was a real pleasure to step back into a warm house that smells of freshly-baked cookies! 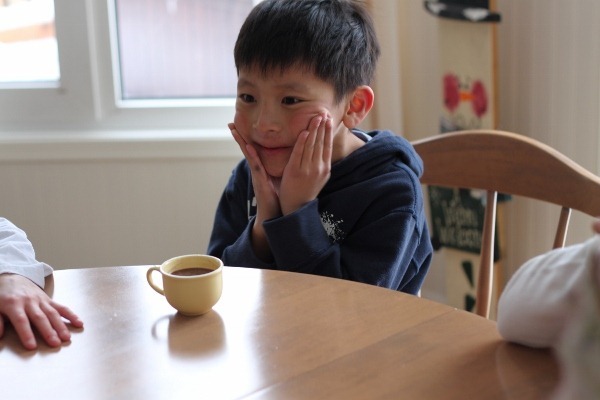 Hot chocolate to warm their bodies up! 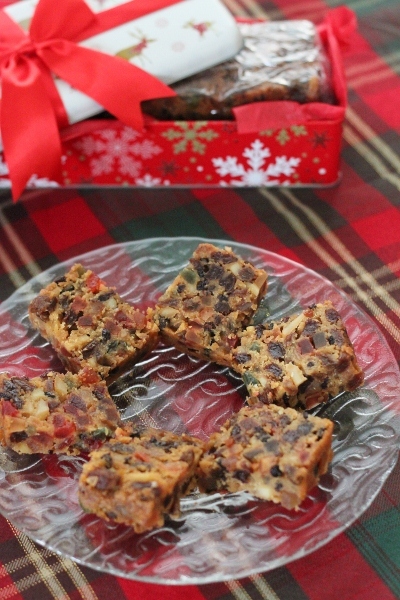 I’m not a big fan of rich fruitcake but this particular recipe from my mum, I like. The taste of alcohol is not overly strong and it’s not too sweet either. Big Kid likes it so it’s suitable to a kid’s palate although I have to say Big Kid does not have a palate of a typical 7-year-old! Put fruits and peel in a medium bowl and pour over 1/4 cup brandy, 1/4 cup liqueur (I used Cointreau) and 2 tablespoons rum. Toss the fruits and cover the bowl with food wrap. Soak up to 2 weeks. If using glazed mixed fruits, rinse fruit before using. Line a 8″ square tin with 2 layers of parchment paper. Leave the paper higher than the sides of the tin. Preheat oven to 150 degrees C/300 degrees F.
Cream butter and sugar till light and fluffy. Add in eggs one at a time, beating well after each addition. In a large bowl, stir together the flour and almond meal. Add in the soaked fruits and almond nibs and turn to mix evenly. Pour cake batter into the bowl and fold mixture by hand. Scrape mixture into pan and bake at 150 degrees C/300 degrees F for 30 minutes then lower temperature to 120 degrees C/250 degrees F and bake for 2.5 hours and top turns golden brown. 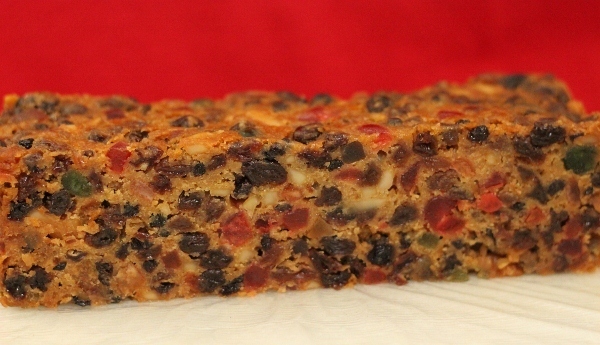 Brush top of cake with 2 tablespoons of brandy/rum while cake is still warm. Let cake cool completely before wrapping in food wrap and storing in an airtight container. Wait at least 2 days before cutting. The cake is successful when it doesn’t crumble when cut. Cut cake with a thin, sharp knife. The cake will mature and taste better overtime. 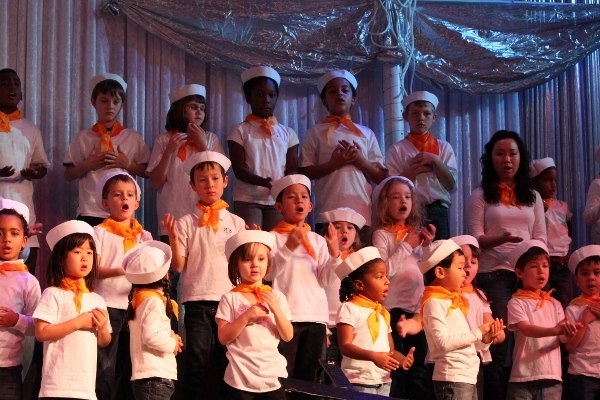 It’s the time of year when schools are having their winter concerts/Christmas celebrations. 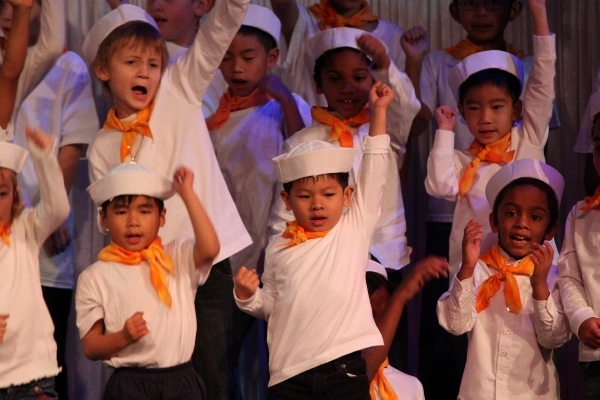 Last week we watched our boys in their respective school presentations. 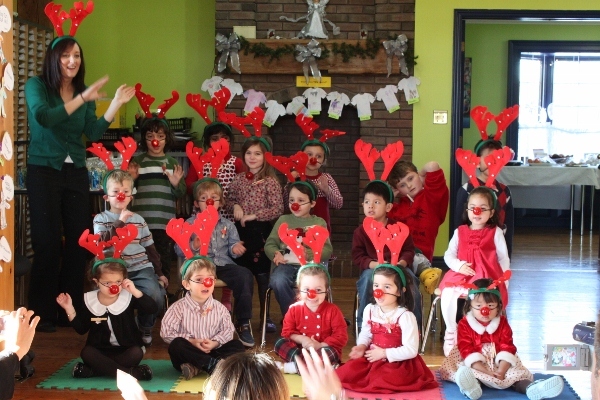 Little Guy’s Oxford Learning school had their ‘Celebration of Light’ on Wednesday. They did a little song presentation and then we had time for crafts before lunch and a Santa appearance. 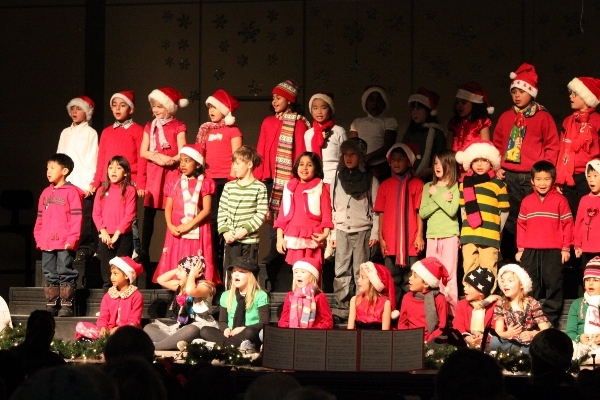 Big Kid’s school held their Primary Winter Concert on Thursday. 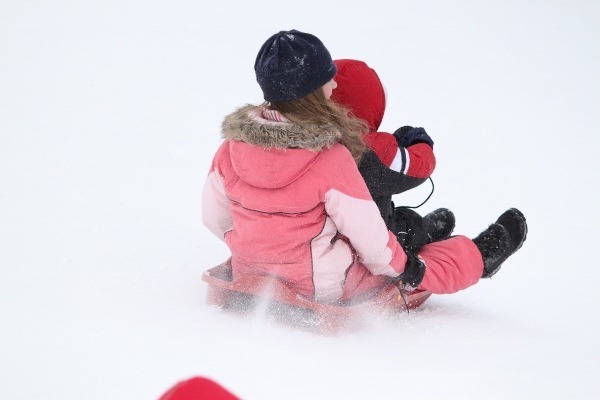 I would love to post a clip of him singing Au Royaume Du Bonhomme Hiver (Winter Wonderland in French) unfortunately my WordPress blog hasn’t been upgraded to do that. 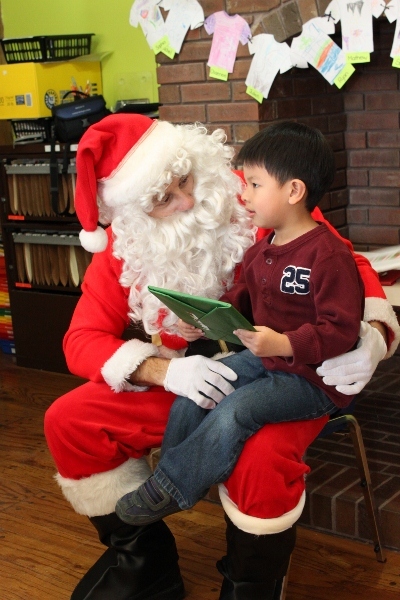 The presentation that we’re most proud of was the one from our church on Dec 5th. 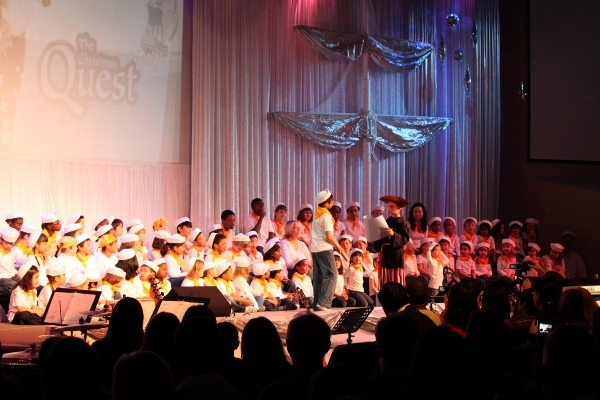 It was called ‘The Christmas Quest’ and both boys sang and danced to 5 songs that were part of the play. 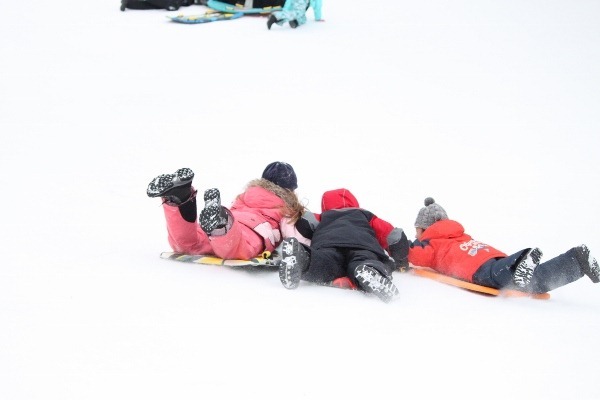 All the children did so well and they were a joy to watch.